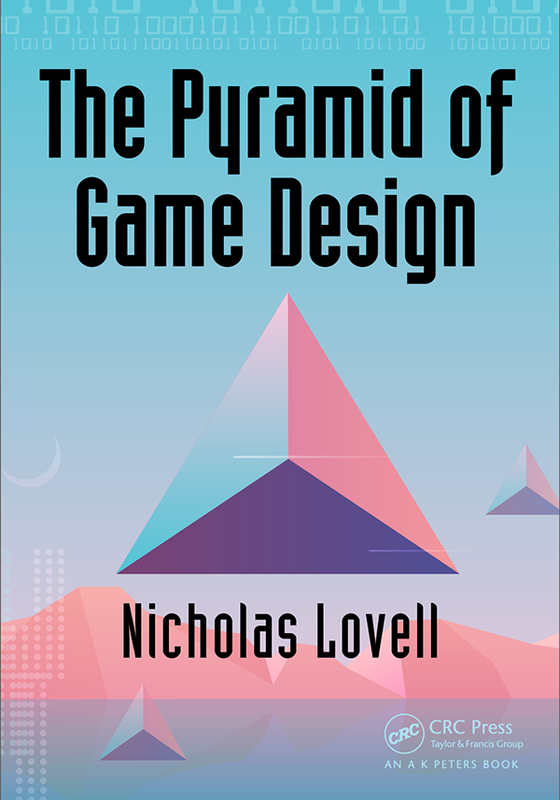 This is a guest post from John Cheng of Playnomics. It is the first in a series of three posts about player retention. More to come in the new year! And as with dating, engaging and retaining players early in the lifecycle is absolutely critical for long-term engagement. 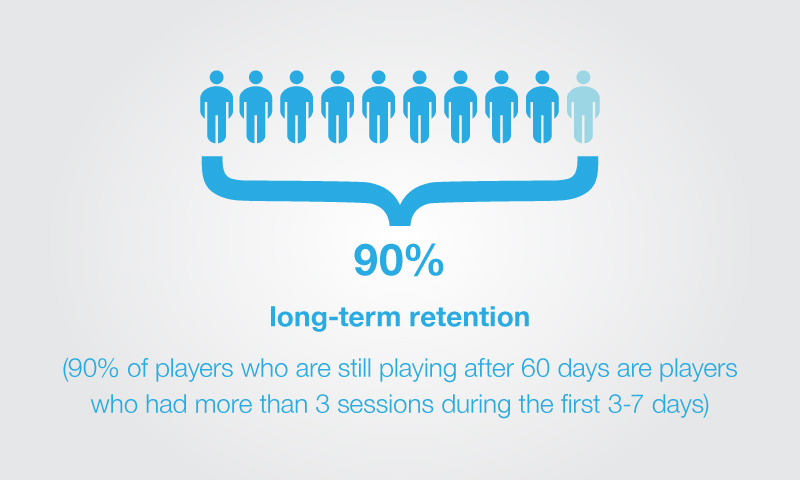 In fact, “Early Lifecycle Retention” (defined as the number of sessions played in the 3-7 days following a user’s first session) is the strongest predictor of long-term engagement because players are forming crucial first impressions about your game and habits about how they will play and interact with your game long-term. 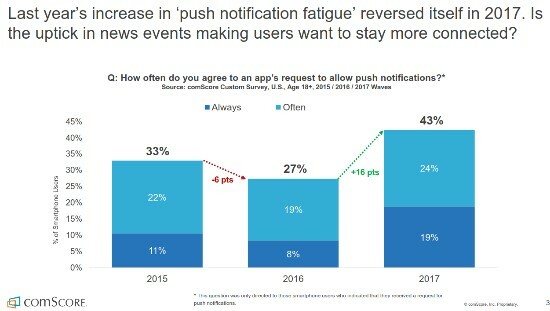 Driving repeat visits in the first few days is essential for increasing LTV and player engagement that will continue throughout a player’s lifecycle. If you believe as we do that it’s more effective to keep a player than to continuously acquire new ones, then having a highly focused plan for Early Player Retention is key to success. We’ve seen up to 5x the ROI from players who make it to day seven. This series will shed light on some of the most critical aspects of acquiring and keeping your most valuable assets up front. We’ll examine three targeted messaging strategies for Early Player Retention that leads to longer, better-monetized player engagement. If game publishers are bachelors, the onboarding process is everything you’d expect from a first date. Here’s where a suitor has multiple, significant opportunities to interact with their “date” (player) right off the bat. Marketing and design must work together in onboarding, just like a bachelor needs to be charming, not just look the part. 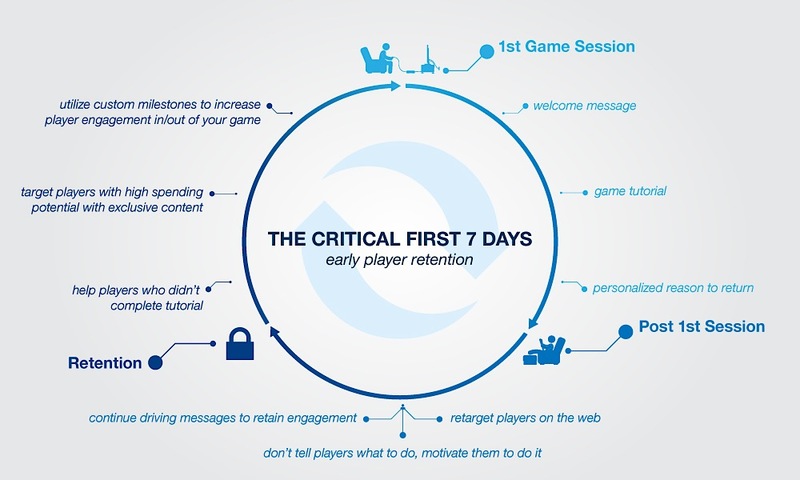 It’s not just about welcoming a player; it’s about taking every opportunity in their first session to communicate messaging that maximizes retention. 1) Welcome the player and set the right tone for your game. 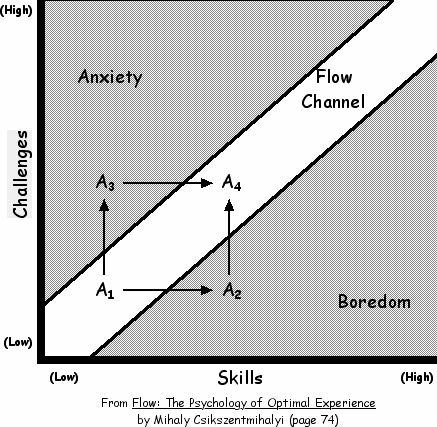 2) Shepherd players through the tutorial process, matching the right level of education to each person’s expertise. 3) Give players a personalized reason to come back and play those critical next sessions. Unfortunately, most games have a one-size-fits-all approach to welcoming players. This is the wrong way to speak to someone who has essentially just walked into your game. The right time to make someone feel welcome in your game should obviously be during a player’s first session. First impressions mean everything, seriously. Your first date with a player should leave them with enough knowledge to play and enjoy the game, but enough mystery to come back for more. In tutorials, it’s also important to naturally weave in the onboarding messaging as a complement to the in-game mechanics. Personalizing the tutorial experience adds value to gameplay steps and actions that a player takes during those precious moments when they’re learning about your game – whether they’re more experienced players or not. Finally, the first date is ending. Oh it was lovely. Will there be a second? Time will tell, but for now, you have one more opportunity to leave a good impression – the goodbye. Make it count. Make it personal. All of the data we have says that personalized in-game welcome messages (i.e. tailored to where a player came from or their particular play profile) more are likely to be read, clicked on and responded to. This is why Playnomics always encourage our customers to use personalized messaging, especially for Early Lifecycle Retention. Here’s how you’d set up a dynamic welcome message in PlayRM in thirty seconds. In the next part of this series, we’ll talk about strategies for post-session retargeting. For bachelor game publishers, this is like sending a text message or making that ever-critical phone call after the first date. If your player enjoyed their first experience (if your first date went well, that is), you’d better make sure to follow up afterward. She could be the one! About the author: John Cheng is a co-founder of Playnomics and leads product vision and development for the team. He focuses on maintaining a close dialogue with customers and tailoring the product to meet their needs.